Size of the product: 3" (L) x 14" (W). The arti dish is made of steel and it comes with a Pooja thali and five diyas. Decorated using minakri at work, this arti dish is sure to be very attractive. 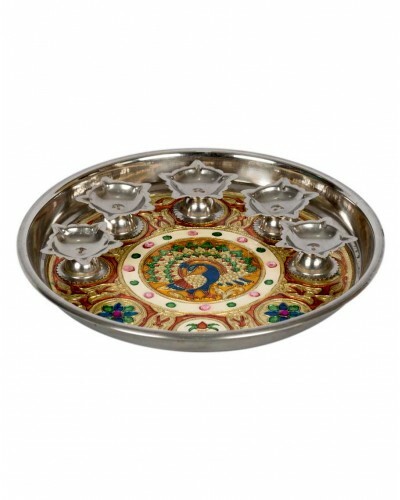 It can be used during any Pooja and is perfect for every household. Exquisite art work in the thali makes this piece unique and stand out from other arti dishes. Highly skilled artisans work painstakingly and lovingly on each piece preserving its uniqueness and beauty to make it everlasting. Be it a Personalized gift or a Wedding Gift.